The last ten days have seen some increased visibility of wikis. Saw the introduction to MSDN wiki. I blogged about it here. The very next day, I saw eBay's wiki announcement (based on JotSpot). This blog talks about it being the largest commercial wiki. Got an invitation for beta from WetPaint. Checking it out right now. Looks pretty good. Michael Arrington thinks it is the best wiki so far. Saw a mention of keynote by Eugene and Doug at Wikisym about Augmented Wiki. Some of these ideas may result in radical improvement of wikis. Read in another blog about Wiki Sharepoint Services (in the new Microsoft Office beta). A Semantic MediaWiki. MediaWiki is the engine that powers Wikipedia. This should be an exciting project. I might have missed many other cool Wiki Happenings. Now I need to dive in deep and immerse myself and make sense of some of the directions. Live.com moves up to Top-10 in Alexa rankings. This brings the number of Microsoft properties to 4. Here is a copy of the screen-shot from InfoMinder. I am trying a test post from Flock. So far the experience of using it is pretty good. I had no trouble importing my settings from Firefox and IE and getting started. I judge a product by the first 15 minutes of experience. This was one was smooth as silk. The first para was written with Flock. I am editing this now in WordPress. I did not know what to expect when I typed this entry in Flock. When I clicked "Publish", it came up with a list of categories for me to choose. That is pretty cool. I can definitely see using this interface once in a while for blogging. You can download it from here. You can go to this blog to get more information. Here is coverage from Michael Arrington at Techcrunch. The Flock blog is worth reading. It tells you how tech companies work. I have taken the liberty to borrow a few lines from Anthony's post on Cardinal – Flock 0.7 release. If there is one thing that I have learned to love about people who work in technology, it is that stupid imperative to make stuff, even if it drives them into the floor. So cool. We are still burning midnight oil, still drinking caffeinated Blues, still waking up next to laptops. Really, for the last few months, we have been pouring our hearts into this release. We hope that some of the effort shows. It certainly does. I plan to spend some time this weekend exploring the "social browsing" aspects and reading reactions in the community. Blogged with Flock and edited in WordPress. There is a page navigation bar on the left, content in the middle and community stats on the right. You can check it out here. Here is the FAQ page. To add content, you navigate to the page you want (using the page navigation bar) on the left and click on Add content. I tried adding content. Works fine with IE. Since Firefox was not supported in the current version, I got an error. The FAQ page, says that support for Firefox is planned. There are some nice touches mostly UI related. I think with this wiki, Microsoft will expand the usage of wikis. I plan to explore it further over the next few days. 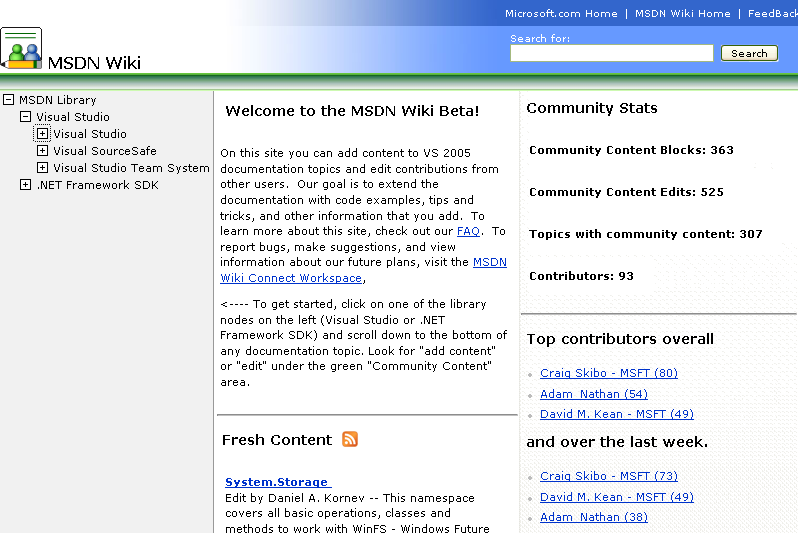 get experience on MSDN Wiki Beta…! a sense of how helpful a Wiki can be for user documentation. via Steve Pietrek. more examples form the community and by thus more information for other people. The video is worth watching since Arno goes through a step by step process of what they do, how they do it and why they made the decision to do it. Here are the highlights. XML11 takes a Java/AWT desktop application and starts with the produced bytecode. There are several reasons, I like this approach, assuming that it works. A lot of people are already familiar with AWT programming and they can produce and test their code using Eclipse and then simply convert it to a working AJAX application. Arno sums up the presentation with a list of differences between the GWT approach and XML11 approach. The major difference, which may ultimately decide the fate/popularity of the toolkit is how well it works and what kind of support the team can provide. It is an open source project. You can get more information at xml11 site. This is a unique application of XML. XML is used to describe a stack machine. When one of the members of the audience asked Arno, why they chose XML instead of using some other format, he had a pretty cool answer. They can do a similar translation from a .NET app (using the .NET IL which is conceptually similar to java bytecode) to the intermediate XML format as well. Then, the rest of the tools (converting XML to JS) can be reused. In order to help people reuse (assume that they have no motives for reinventing). 3. We need to make it easy for people to write and share reusable XML elements. I think microformats are a good way to achieve this, though I have not written one to see whether they meet the criteria. Microformats.org is doing a good job of the educating users on simple reuse and development of structured content.The geek in me tells me to use RDF since it is so much more powerful and cool, and the pragmatist in me says that I can start simple with something like Microformats and see how far I can go. I am not sure how I missed this. Here is an announcement on Technorati of a new search/ping service for Microformats. I'm very pleased to announce the technology preview of Technorati microformats search for contacts, events and reviews, and Pingerati, a microformats ping distributor to support and grow the microformats ecosystem. Microformats are the key building block, the lingua franca, that make structured information open and sharable on the Web. In case you are curious about the significance of Microformats, here is an excellent tutorial presentation. I located this, thans to this blog from Duncan Cragg. Duncan has a lot of good stuff on how Microformats may challenge Web Feeds (popularly known as RSS). I am curious to find out more. I thought of RSS as a delivery mechanism for microformat content. But Duncan has a point. Like Search engines discover and index your pages, services such as microformat search can discover structured content and provide access. Why not use Web Feeds to distribute microformat content? RSS is extensible, anyway. I got my invitation for the Google Spreadsheet and promptly signed up. Not being a financial type, I created a couple of task lists and shared it with two different friends with email. I played around with the basic operations a bit and was reasonably satisfied. Why would any one use an online spreadsheet? I am not going to put my finances or any sensitive information there. Knowing Google, they probably have something up their sleeves. What they do not have, unfortunately is the large amount of feedback that Microsoft must have, from several millions of Excel users. The current version is not bad for a free product. But it is not earth shattering. C/Net News somehow thinks that, this will turn up heat on Microsoft. I am not so sure. Information Week on the other hand says that Google beta does not add up. Exactly. For more on Google Spreadsheet, try this. Posted on June 8, 2006 Categories Uncategorized4 Comments on Google Spreadsheet – Am I Missing Something? Found this link from Danny's post about MicroLearning Conference. I was curious about the concept so went to Microlearning.org and found this wiki. …is a term used in the e-learning context for a learner’s short interaction with a learning matter broken down to very small bits of content. At present this term is not clearly defined. Learning processes that have been called “microlearning” can cover a span from some seconds (e.g. in mobile learning) to 15 minutes (learning objects sent as e-mails). Exploring this wiki led me to the concept of Microknowledge. Microknowledge is not identical with a set of Microcontent chunks. Just like Knowledge is by definition (see there) having the form of more complex structures, Microknowledge cannot not be seen as consisting of separate information "atoms" or self-contained micro-messages. Microinformation only becomes Microknowledge when bringing with it the momentary experience of immersion in a wider, more structured knowledge space. This micro-knowledge space is again mirroring the structure of the Web itself (small pieces loosely joined). In fact, the Web itself is experienced as a micro-knowledge space. I think this is a useful concept of providing small bytes of useful information. Especially in task-oriented and informal learning contexts. I need to spend more time on this wiki, following links and well – microlearning. Just got a confirmation email for Mashup Camp2. Wow! There are already more than 600 people confirmed todate. Looking forward to meeting all these people.